Peaceworks: Happy About Your Taxes? In the era of Trump, tax policy is being used as a vehicle to engineer economic and social change, pretty much all of it to the detriment of the vast majority of our population, while benefiting primarily the most wealthy and powerful. The Trump/GOP-passed Tax Scam, while labeled “tax reform” is actually an upward redistribution of wealth, as well as a tool—due to the massive increases in the deficit it is producing—to facilitate the dismantling of programs that benefit society at large. It’s widely acknowledged that very few people enjoy paying taxes. This said, there are two primary criteria which, if met, make most of us feel better when it comes time to file. First, taxes must be fairly levied. Second, the revenue must be spent in ways that benefit society as a whole. Let’s start with fairness. Some taxes are progressive, some flat and others regressive. Progressive taxes take into account ability to pay and require those most capable of paying more to pay at a higher rate. Regressive taxes are just the opposite. They take a larger percentage from those who are less able to afford it. And flat taxes assess everyone at the same rate. An example of progressive taxation is a multi-bracket income tax system where there are stair-step tax rate increases for incomes above given levels. While U.S. income tax once was very progressive—and could be again—over recent decades the brackets have been repeatedly flattened and loopholes put in place that favor the well-heeled. Warren Buffet, one of the richest people in the United States, famously observed that his income was taxed at a lower rate than his secretary’s. 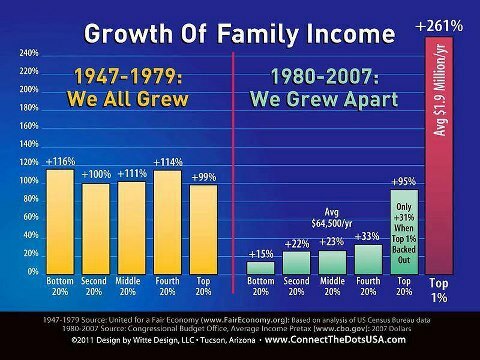 When unearned income, including capital gains, is taxed at a lower rate than income earned through wages and salaries, we end up with an unfair system in which the “rich get richer,” their money making money and largely avoiding taxation. Another example is the carried interest loophole, which allows hedge fund managers to pay a much lower tax rate on their often enormous incomes. Trump had promised to eliminate this, but his “reform” failed to include such a provision. In fact, most of the Tax Scam benefits to working and middle class Americans are temporary, while those for corporations and the wealthy are permanent. According to the authoritative Tax Policy Center, after ten years 83 percent of the tax cuts would go to the top one percent, while 53 percent of the population would pay more than they would have without this “reform.” Real reform would have made our income tax system more progressive, not dramatically less so. Sales tax is an example of a regressive tax, particularly when it is levied on necessities like food. While all who make purchases are taxed at the same rate, people of low or middle income spend a much larger portion of their incomes on taxable goods, while the wealthy often invest a goodly portion of their income in non-taxed purchases, including homes, or in financial assets like stocks and bonds. Some politicians have proposed establishing a national sales tax and using this to replace income tax. This would be a big step in the wrong direction. Thankfully, it is not being pursued at the moment, but be aware that this scheme, often mislabeled as the “Fair Tax” is grossly unfair and should be, in our opinion, opposed if it resurfaces. There are taxes that could be enacted that would be both progressive, in terms of charging based upon ability to pay, and also boast side benefits. One is a financial transactions tax; a small tax applied when financial assets are traded. You might recall that during Sen. Bernie Sanders’ 2016 presidential campaign he proposed levying such a tax and using the proceeds to fund tuition-free education in public colleges and universities. Aside from the revenue gain, such a tax would encourage investments maintained for the medium to long-haul and discourage the sort of speculative buying and selling that has turned Wall St. into a casino. Another beneficial tax is a Carbon Tax which is sometimes proposed to be revenue neutral and called a “carbon fee and dividend” system. This can be implemented by attaching a fee onto each unit of fossil fuel sold and then rebating the full amount collected to the public giving each person the same amount. This would encourage energy conservation and reward those who use less energy. Also, rich people generally use more energy, as they travel more, buy more things with energy embedded, have larger—and sometimes multiple—homes to heat, cool, etc., they would be paying in more in carbon fees. Since the rebates would be equal, not based upon energy consumption, this system would both create proper incentives and also redistribute downward. Growing economic inequality is exacerbated by less progressive tax codes. Over the past four decades, inequality has been on the rise. Just looking at real (inflation adjusted) wages over the period from 1979-2016 wages for the bottom 90 percent increased by just 21percent, far less than the growth in productivity. The latter, which measures real output per hour worked, increased by more than 130 percent. While many low-income workers saw no wage gains at all, during this period wages for the top one percent increased by a whopping 257 percent. And this is only considering earned income. Income from investments, which are mainly the province of the well-to-do, are not included in these figures. This growing inequality has marginalized tens of millions of people, shutting the door on the American Dream. Concentrating wealth is also bad for the economy as the über-rich literally have more money than they can spend, while others lack the means to purchase all that the economy is able to produce. The move from progressive to more regressive taxation has played a role in getting us to where we are today. While making taxation more progressive would not solve inequality, it would be a big step in the right direction. We taxpayers are far more likely to feel positively about our taxes if, in addition to being fairly assessed, they also are spent in ways that benefits our society as a whole. Note: it’s not so much a matter of “Do I personally benefit from this spending?” as it is “Is our country better off overall?” One might not have kids, or kids who are attending public schools, but we are collectively better off when our nation is well educated, thus spending what’s needed to provide quality education for all is something we all must support. 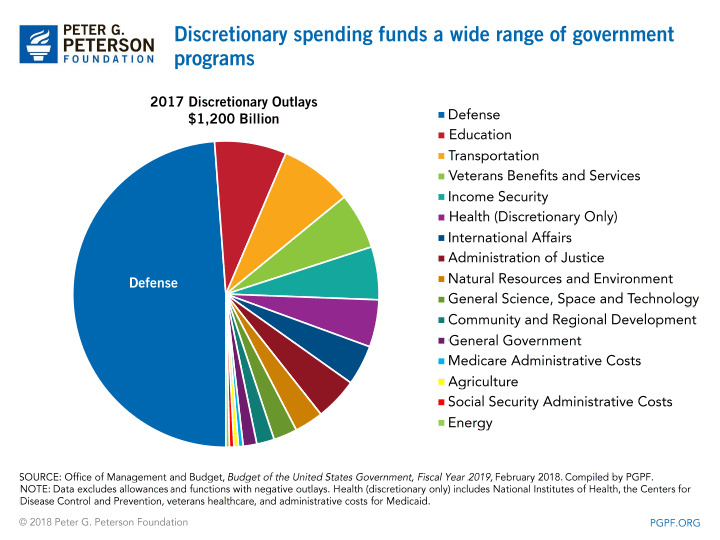 Looking at the Federal budget we find that for FY 2017 fully 49 percent of discretionary spending went directly to the military. When veterans’ benefits, intelligence, military foreign assistance programs and other such items are included, the total is closer to 60 percent. And the Pentagon budget was increased again for FY 2018. 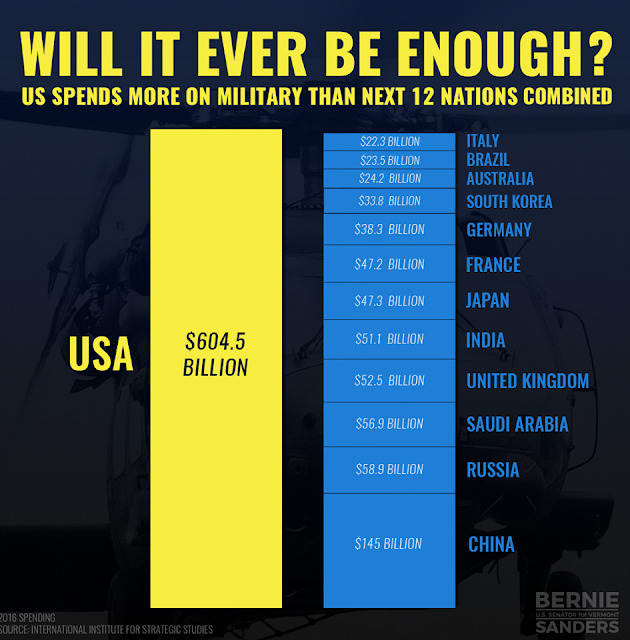 Please consider that in 2016, the last year we have numbers for, the U.S. spent more on the military than the next eight largest spending nations, combined. And note that six of the eight were U.S. allies. It is likely that 2017 figures will show that we spent more than the next 12 largest spenders combined. While the government and media call this “defense spending,” most of the spending has nothing at all to do with defending the country. Rather, most is spent “projecting power” around the world. The U.S. military is engaged in overt and covert wars and operations all across the globe. They aim to dominate on land, air and sea, plus space and the cyber-realm. This benefits the Military-Industrial Complex, but certainly not the average American. The greatest real threats to our security come not from non-state actors or hostile powers, but rather from climate change and other human-caused impacts on the biosphere. We have often heard it said that wars in the future will be fought over water and food. If we aim to avoid this prophecy coming true, there are things we can, and must, do now. We here in the United States need to spend what’s needed to affect deep reductions in greenhouse gas emissions ASAP. We need to encourage and support the effort of other nations to do the same. We also are more secure and healthier when we have clean air to breathe, clean water to drink and a decent supply of nutritious food, free from toxic chemicals. Spending in these areas benefits all of us as well. Population is an underlying issue that must also concern us if we hope for a secure future. Human population, which did not reach 2 billion until approximately 1900, hit 3 billion around 1950 and is at 7.5 billion today; with projections of 9-10 billion by mid-century. Not only are there more of us, but our average level of consumption, and thus our average impact on the environment has increased significantly as well. There are several things that have proven most important in addressing population growth. Most obviously, contraception needs to be readily available to all, as does the right to choose whether or not to continue a pregnancy. At least as important is the empowerment of women. Where women get to make decisions about childbearing, birth rates come down dramatically. Also very important is a strong social safety net that assures everyone that they will have enough to live on comfortably in their old age, without having to rely on their children. While we need a stronger social safety net, Trumps budget proposals cut these programs dramatically. While climate change, a livable environment and stabilizing population are urgent priorities, there are many other areas where we should be spending more. Education and infrastructure are both near the top of that list. Funds directed into these areas are actually investments. They will more than pay for themselves over time. 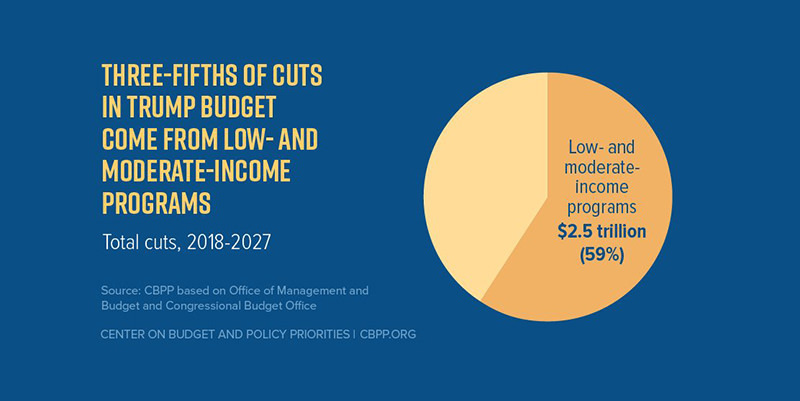 It is also essential that we ensure that Social Security, Medicare, Medicaid and other programs we collectively depend on are adequately funded and protected from cuts. As we consider “mending our spending,” it would be good to look to the public as a whole for input. Sadly, today powerful corporate lobbies have much more to say about what does or doesn’t get funded than we, the people, do. We need to work hard to change this, and can do so by actively supporting and helping to fund the campaigns of those who are likely to listen to us. There is no shortage of work to be done to address the unfair tax system and the misdirected spending priorities. Please recognize that these problems won’t be solved overnight. While the current administration has badly exacerbated the situation, things were already a mess before Trump was elected, and that, in fact, is part of the reason he was elected. It’s up to us now to articulate a positive vision and work as hard as we can to realize it.